“A month-and-a-half later, the murder of this scholar has set off an unusual movement with little precedent. Writers from across the country are standing up in protest against the Sahitya Akademi, a literary body that represents 22 of India’s languages, and the state. On 12 September, the respected Hindi writer Uday Prakash announced that he was returning his Sahitya Akademi award – one of the highest honours bestowed on Indian authors – along with its other components; a shawl, a plaque and cash prize. 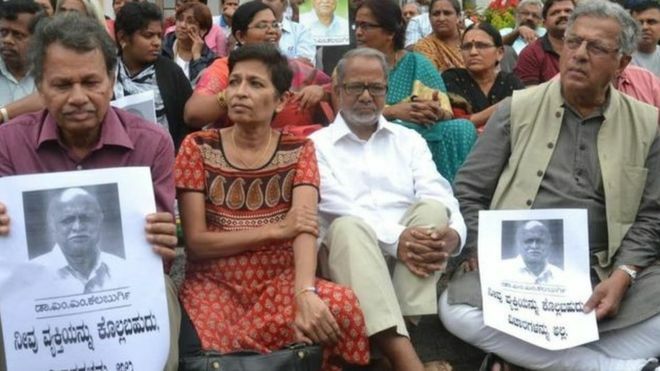 He cited the rise in incidents of “suppression and violence” over the last year – book bans, the plight of writers like Perumal Murugan who was forced into silence after attacks by right-wing groups, the killings of rationalists such as Mr Kalburgi and Govind Pansare, as well as the heckling of respected authors such as the late UR Ananthamurthy…. Then the venerable Karnataka author Chandrashekhar Patil returned his state awards, plaques, idols and cheques – “everything except the garland”, he said. His aim was to protest the murder of Dr Kalburgi, and also to draw attention to what he saw as the growing assault on free speech and the attacks on rationalists. Many of these assaults and attacks have been perpetrated in the last year by fringe right-wing groups: it is easy for the government to disclaim any connection with them, but it is also glaringly obvious that it has done very little to discourage groups like the Shri Ram Sene, notorious for issuing threats – they offered to cut off the tongues of writers who insulted Hinduism, for instance.